“Children in the Reflecting Pool,” Histories of the National Mall, accessed April 22, 2019, http://mallhistory.org/items/show/171. The Reflecting Pool was never intended to be a swimming pool. In the late 1920s, however, people cooled off in its waters because there were not many other options. 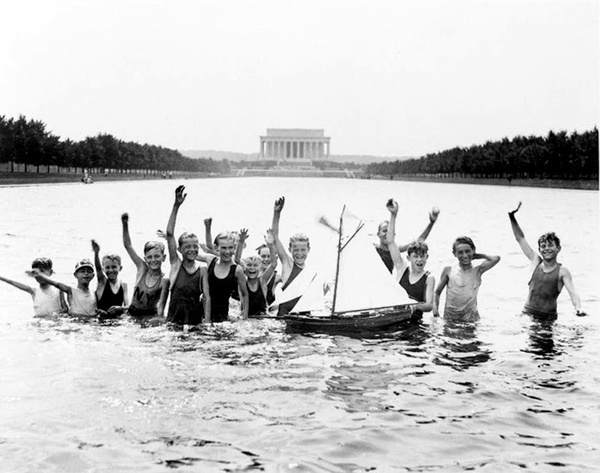 The beaches at the Tidal Basin closed in 1925 due to concerns about water quality and increasing conflict over segregation. Washington, DC, had only a handful of city pools, which were always crowded and cost money to access. City residents used public bodies of water like the Reflecting Pool, the fountains near the Capitol, and other fountains throughout the city, as public pools, despite laws and regulations to the contrary.